I have recently added a couple of new links on the links sidebar; it seems to me that there are some relevant points worth airing and asking about, in the area of attribution of work. I’ve written before about the difficulty of attributing work to artists in the absence of proper printed story credits (how much harder to attribute work to writers! but that’s another post). On this blog many of the names of artists have come from information supplied by experts such as David Roach, or from internet links written by others who are particularly keen on one or other artist themselves. How to verify these different sources, when even experts can make mistakes or have their attributions occasionally mistyped? Take Angela’s Angels, for instance; which has been consistently attributed to Alberto Cuyas on this blog. It now seems clear to me that we should have been listing him as Manuel Cuyàs all along, as this set of links on Spanish-language blog Deskartesmil shows. I got to that information via a link on the Comics UK Forum while looking for another artist, Stanley Houghton. Now Stanley Houghton is someone who is a possible candidate to be credited with the art on “The Hostess With The Mostess“; I have been pointed at a very useful reference site, Catawiki, which lists him as the artist on one issue of “Hostess” but not all of them. I will have to go back to my issues and see if the artist on this strip differs in different weeks, particularly as the Stanley Houghton art I have seen on links is very nice and I don’t remember the “Hostess” art being as nice as that. So at this rate I have at least two sets of changes to make, one of which is more uncertain than the other. 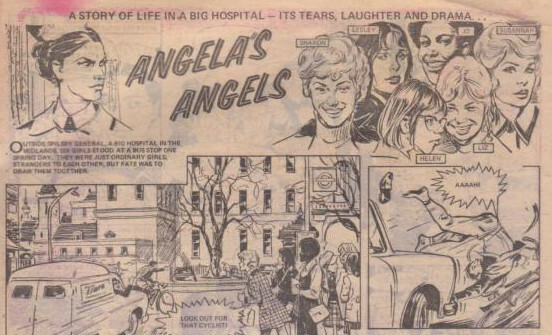 Another name I have come across on Catawiki is Leo Davy, who is credited with the art on “Angela’s Angels” (see how it comes full circle!). There is little on the internet about this artist, but new-to-me blog ‘Out of This World’ has a post that includes the fact that Girl credited artists and writers, at least on the annual that is discussed. 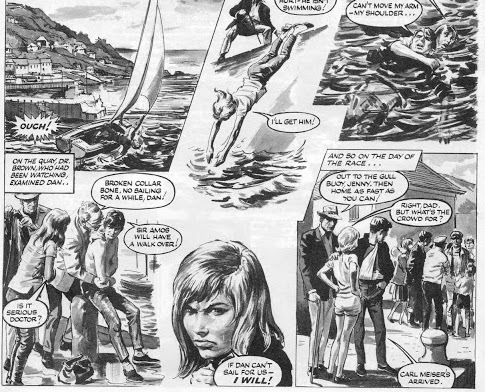 There are some pages of Leo Davy art posted there (it’s a long post, so search for “The Red Pennant” which is the story that Leo Davy drew). Based on this, I don’t agree with Catawiki’s attribution of “Angela’s Angels” to Leo Davy, but I am sure that Davy drew other stories I have come across. Anyway, I have now linked to Catawiki and to ‘Out of This World’; the Comics UK Forum was already on the sidebar of links and has provided much useful information (and indeed scans) before now. I think the only conclusion that can be drawn is that attribution of artists is hard! The scans on sites such as Lambiek’s Comiclopedia, which I also use as reference, are often quite small and show the variety of styles that an artist can work in, which is great, but I think the best way to identify an artist is often a specific ‘tic’ – the way they draw hands, or mouths, or even shoes – and for that you need a good-size scan so that you can really focus on those details. Later on I will update this post with some images from the various artists in question, and some “Angela’s Angels” artwork, as a direct comparison! Quite a nice range of faces, and a good couple of active moments in those first panels, meaning we should hopefully have enough to go on. This is the art credited to Manuel Cuyàs, on a specialist Spanish blog. Some similarities to the “Angela’s Angels” art but also some differences there I think, in the faces and linework. (The same blog credits Manuel Cuyàs with “Angela’s Angels” but without attaching any art examples.) On the basis of these examples, I am tempted to retract the assignment of Cuyàs to “Angela’s Angels”, in fact – though I definitely have another Jinty story (in an annual) that I would be confident of saying is by Cuyàs. This is the Leo Davy art, credited clearly in the Girl Annual posted about on the ‘Out of this World’ blog. Of course “Angela’s Angels” isn’t in this more painted style. Again, there are similarities but I am not clear that this is the artist either. So reader, what do you think?